If you have previously uninstalled Steam games from your computer to free up disk space or remove a distraction, you may eventually decide you want to reinstall the games that you had previously deleted. Or perhaps you have a game in your Steam library that you haven’t installed onto a new computer, but you want to do so. 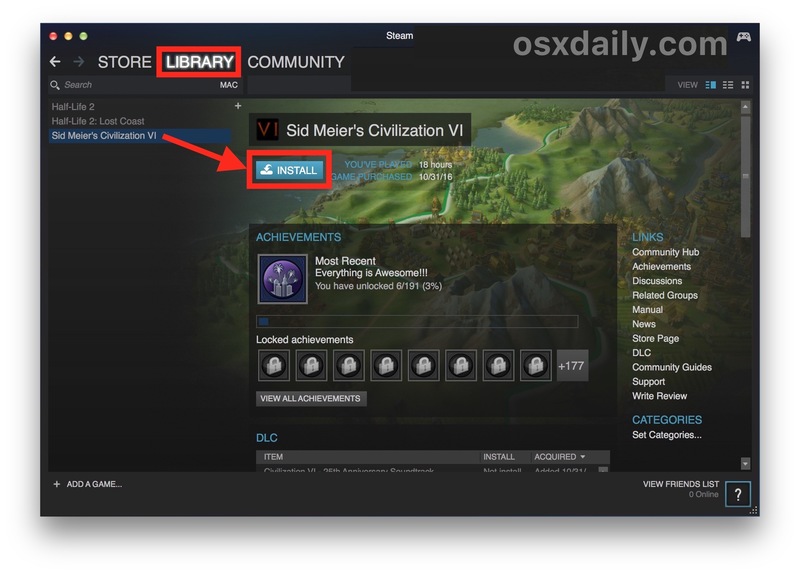 Fortunately the Steam application makes re-installing any Steam game onto a Mac, Windows PC, or Linux computer very easy, as you will see in this tutorial. It’s important to remember that Steam games are associated with a Steam account. Thus, if you had previously deleted a Steam game you would need to use the same Steam account to reinstall that Steam game, because the game is attached to that Steam accounts library. That’s how most App Stores work by the way, associating the apps and purchases with the account used. Remember, you must use the same Steam account that contains the game you wish to reinstall. You will also need an active internet connection to re-download and reinstall the games. The game will re-download and reinstall within Steam. This can take a while depending on how large the game is along with the speed of the internet connection, so be mindful of that when you’re reinstalling any Steam game. 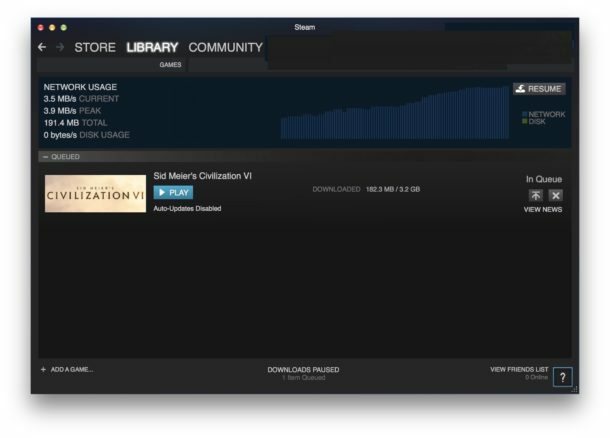 In the tutorial example here, we’re re-installing Civilization VI onto a Mac via Steam that had previously uninstalled the game. You can watch the download progress, pause the download, or cancel the download and reinstallation of the game if desired for whatever reason too. You can reinstall any previously owned Steam games this way using the Steam client on any Mac, Windows, or Linux PC. This is also how you reinstall a Steam game onto a new computer. Regardless of the platform, the re-installation of the game(s) are the same. Obviously this tutorial is using a Mac but the Steam client is the same on all supported platforms. Oh and one final tip; if the reason you had originally deleted the Steam games in the first place was to free up disk storage capacity, then you may find it useful to move the Steam games and saved game files to a new hard drive, whether it’s another internal drive or an external drive – for best results in either situation you’ll want to make sure it’s a fast drive though, whether that’s a USB flash drive, external SSD, or otherwise. Steam is a popular gaming distribution platform for it’s large gaming library, cross-platform nature, but also because of how easy it is to maintain a game collection that is easy to install, manage, delete, reinstall, and even play on different compatible platforms with many different gaming titles. If you’re a gamer, Steam is an essential. Enjoy your newly downloaded and reinstalled Steam games! Since Aspyr screwed up both Call of Duty:MW3 and COD4:MW, multiplayer for Macintosh, the only COD now is COD:MW2. I would forget the Macintosh for any games in Steam, except just COD:MW2, which is still fun, the Mac is doomed for FPS game play.